The mood of a painting can be strongly influenced by its colors. Interestingly, there are several cases where a painting’s colors are quite abnormal, but the luminance is correct. Our Where system sees the paintings clearly, but our What system is confused by the coloring. Self-Portrait, Pablo Picasso, 1901. Here, Picasso presents himself as a romantic, bohemian figure — a moody young artist who fixes the viewer with a hypnotic stare. In Picasso’s “Blue Period” (1901-1904), his blue paintings portray destitute human beings. Blue was chosen deliberately — deep and cold, signifying misery and despair — to intensify the hopelessness of the figures depicted, such as beggars, prostitutes, the blind, out-of-work actors and circus folk, as well as Picasso himself and his penniless friends. 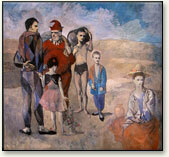 At the time, Picasso even wore blue clothes. La Celestina, Pablo Picasso, 1904. Celestina, a notorious procuress from a 15th century Spanish play is the subject of one of the last great works of Picasso’s Blue Period. Family of Saltimbanques, Pablo Picasso, 1905. These wandering acrobats camped on the outskirts of Paris and appeared in its small circuses. Gradually, Picasso’s colors brighten, in what has somewhat misleadingly been termed the “Rose Period” (1904-1906). Not only soft pinks, but blues, reds and greens complement these images. The emaciated figures became fuller. The new color expresses warmth and life. Picasso’s paintings are beginning to sell, and he now has a studio, a lover and a life. The two periods — the “Blue” and the “Rose” — form a transition between the conventional art of his youth and the iconoclastic art of his maturity. In 1907, Picasso and Georges Braque introduce Cubism, where form no longer appears to follow the traditional rules of three-dimensional representation. The “Blue” and “Rose” periods remain popular because the human figure is less undistorted and more recognizable than in Picasso’s Cubist works.